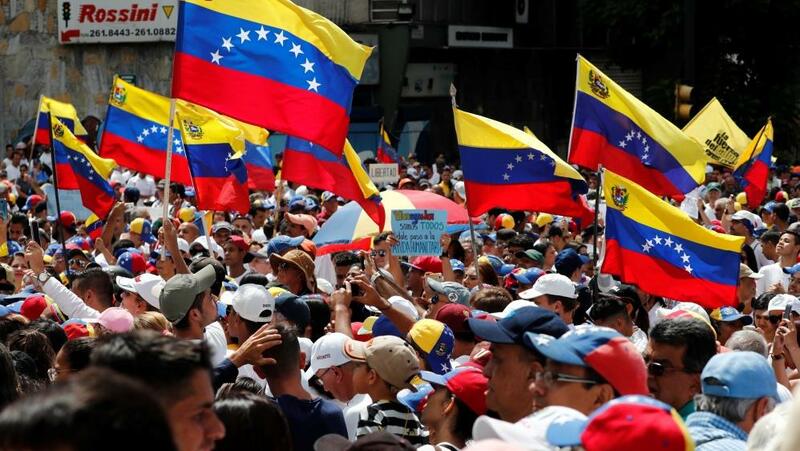 CARACAS, April 4 (Xinhua) -- Both the ruling United Socialist Party of Venezuela (PSUV) and far-right opposition groups on Thursday called on their supporters to gather for a show of strength this weekend here in the capital. "This Saturday, April 6, we are all going to gather from 9 a.m. (0430 GMT) at three key points in the capital," Dario Vivas, the PSUV's vice president of mobilizations and events, told state-run VTV by phone. Party supporters will then march to the presidential headquarters, Palacio de Miraflores, for a massive pro-government rally, he said. Venezuela's far-right opposition, which is being openly backed by the United States and its allies in Latin America, called for nationwide protests to mark the launch of "Operation Freedom," its latest push to oust the PSUV from power. "April 6, the start of Operation Freedom, the start of a definitive phase to end the usurpation, where we are all now agents of change," said opposition leader Juan Guaido, who declared himself "interim president" in January. Guaido, president of the opposition-controlled National Assembly, made the announcement at the Federal Legislative Palace in Caracas. "This Saturday we turn up the pressure. The call is to protest peacefully, strategically and in an organized way in the streets, to reclaim our rights," Guaido said in a Twitter post. Both camps are locked in a power struggle that has intensified since President Nicolas Maduro was reelected in May last year in a vote that was largely boycotted by the opposition, which then refused to recognize the outcome.